People gather near a monument for the victims of the Malaysia Airlines flight MH17 plane crash to mark the fourth anniversary of the accident near the village of Hrabove (Grabovo) in Donetsk Region, Ukraine July 17, 2018. 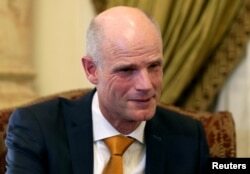 The Netherlands is in diplomatic discussions with Russia about the European country's assertion that Moscow bears legal responsibility for its role in the 2014 downing of a passenger jet over Ukraine, the Dutch foreign minister said Thursday. FILE - Dutch Foreign Minister Stef Blok attends a meeting with Egypt's Foreign Minister Sameh Shoukry in Cairo, Egypt, May 10, 2018. 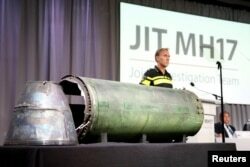 A damaged missile is displayed during a news conference by members of the Joint Investigation Team, who presented interim results in the ongoing investigation of the 2014 MH17 crash in Bunnik, Netherlands, May 24, 2018. 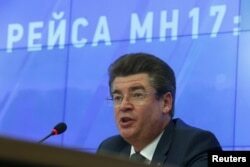 Oleg Storchevoy, deputy head of Russian Federal Aviation Agency Rosaviatsiya, is seen speaking at a news conference on the downing of Malaysian Airlines flight MH17, in Moscow, Russia, July 16, 2015.